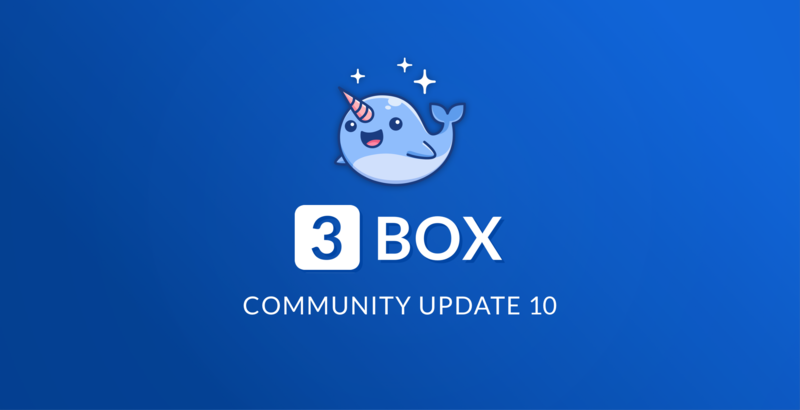 Edition 10 of the 3Box community update details recent releases including 3Box.js Spaces, an updated activity feed for 3Box.io, includes a recap of everything that happened at ETHDenver, and outlines upcoming features including a new profile hover plugin, email verifications, and a Public Spaces REST API. Enjoy! We released Spaces in 3Box.js v1.3, which provide application-specific data storage vaults within a user’s 3Box. Spaces support public data, as well as encrypted data. Read more on our Medium post. 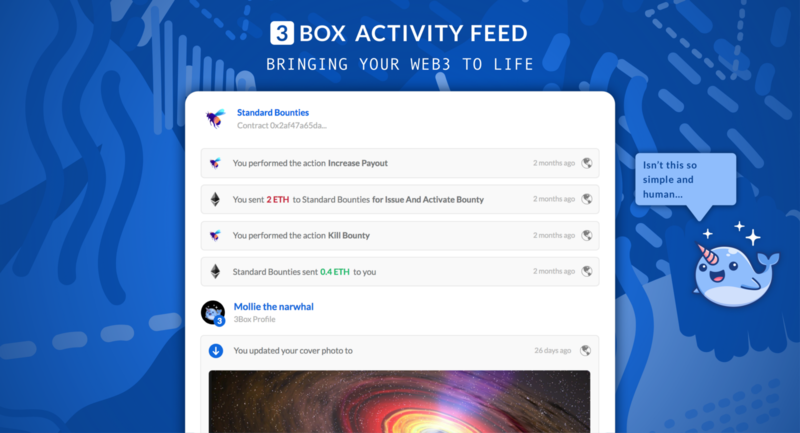 Yesterday we launched a brand new integrated web3 activity feed on 3box.io. The new activity feed provides more context and human-readable detail around each ethereum transaction and 3Box data event, which makes looking back on your complete web3 history more clear and enjoyable. 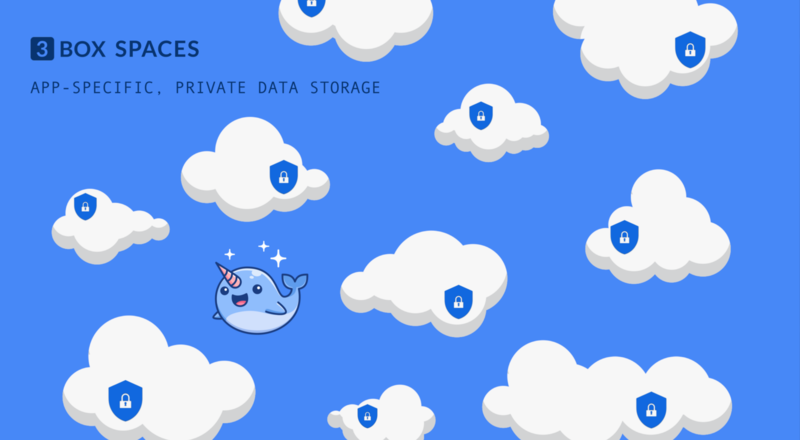 Read more on our Medium post, or view the public feed for Mollie the 3Box narwhal. The project submissions this year were overall beyond impressive. Here are the ones that integrated with 3Box. 🤝 Pactful | Top 20! 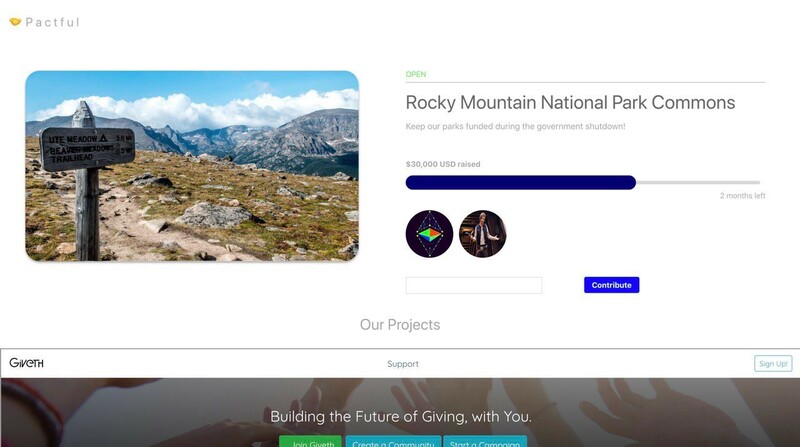 A proof-of-concept interface for launching curve bonded crowdfunding campaigns for social impact causes and organizations. Integrations included 3Box and Giveth. Created by Abbey Titcomb, Seth Feibus, Saga Arvidsdotter, and Cory Dickson. This project was a demonstration of how users can use 3Box and sign off-chain data using an Ethereum key without MetaMask! Users experience a smooth onboarding flow to the dapp, requiring just a phone number from Fortmatic. Then users can use the Ethereum key managed by Fortmatic to provide access to their 3Box, by executing personal sign on our 3Box consent message. Now there is no need for a chrome extension to use dApps which use meta transactions or personal sign! Created by Eric Juta. This project was created by the 3Box team — Zach Ferland, Kenzo Nakamura, Joel Torstensson, Danny Zuckerman, and Michael Sena — because we have a side passion for token bonding curves, memes, and taking a break from the seriousness of building 3Box every now and then. We would be excited to hand this project over to someone also passionate about curves, memes, and having fun. If you’re interested in carrying this project forward, please reach out to us at team@3box.io. For a full breakdown of the top 20 projects built at ETH Denver, check out this tweet thread from the Kauri team. 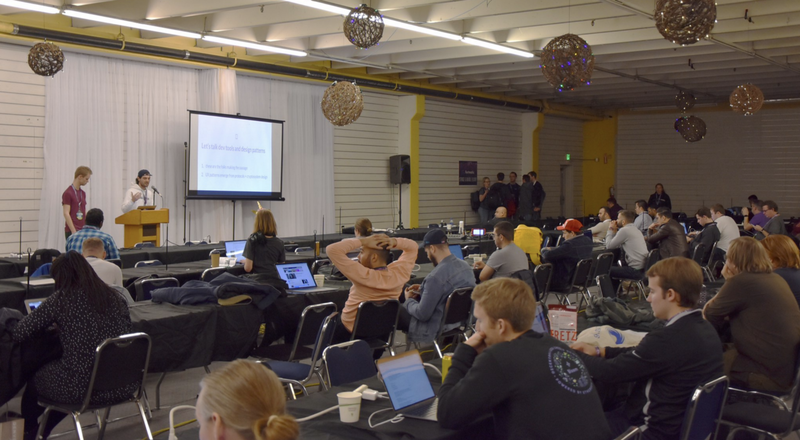 Michael Sena and Joel Torstensson gave a talk to hackers about dev tools and design rules for how to create more user-friendly applications. 3Box obviously being a crucial part of it. Not pictured is the 🔥 demo Joel gave of 3Box.js and 3Box Profile Hover. A huge thanks goes out to the many friends that showed up and had a great time with us at Charlie Brown’s bar. None of this would be possible without your continued support and friendship! We co-hosted with Kauri, Gitcoin, Bounties Network, Panvala, and ConsenSys Diligence. Zach Ferland has been building and testing a new simple way for apps to add profiles to their UI. 3Box profile hover is a widget that replaces Ethereum addresses with user profiles, if they exist. When users hover over an address with a profile, they will see an expanded popup that contains more details about the profile. This is similar to how twitter handles profiles in their app, except we are offering this to everyone! Integration is as simple as adding an HTML script tag to your app. We released a test version of this at ETH Denver but will make a more formal release of Hover this week. You can check out the in-process code here. We’re working on adding an email verification service to the 3box-verifications library and will be implementing it in the 3box.io application. This will allow users to verify their email address once and reuse this verification across all dapps. Users can now begin to build up their trusted, private contact information. Currently, access to user data that is saved within an app’s 3Box.js Space is blocked behind two consent signatures: one to open the user’s 3Box, and another to open the app’s space. This is great for private space data, since user consent must explicitly be given for this data to be accessed. However, this model is inconvenient for public space data that is meant to be made available to other users and applications. We are adding a REST API for Spaces that will allow public space data to be accessed statically. The benefit of this is that public space data can now be viewed by other apps or users without requiring any user interaction, since the user won’t have to sign any consent messages. This update will make public space data function similarly to data saved in the general public 3Box. 3️⃣ 3Box provides distributed data infrastructure for web3. Integrate 3Box.js to instantly make your dapp more social, scalable, and human. Visit 3box.io to create your profile or github.com/3box/3box to dig into the code. Ethereum profiles dapp and developer API. Learn more at 3box.io.